Il est à l'écart. avec une grande piscine 7x4m privé. Notes sur le logement: Il est chaud / froid climatisation. À l'extérieur: La principale caractéristique de ce casita est ses environs. Notes sur le logement: Ne pas chauffer l'air conditionné / chauffage. À l'extérieur: La principale caractéristique de cette maison est son environnement. Il a un grand parc contenant des oranges / citrons et toutes sortes d'arbres fruitiers à votre disposition. De la terrasse et la piscine gaardín vous pouvez voir les belles montagnes qui entourent la vallée de Sóller, la piscine est exclusive pour vous. Blanchisserie: Dehors, il y a une salle de stockage avec machine à laver et fer à repasser + table. Nettoyage / serviettes / linge / nettoyage: blanchisserie hebdomadaire. Buanderie: Dehors, il y a une salle de stockage avec machine à laver et fer à repasser + planche. Service de nettoyage / serviettes / / Femme de ménage: Clean hebdomadaire de lin. Wir hatten eine wunderschöne Zeit in Soller im Casita von Juana und Andres. Sie sind aufmerksame Gastgeber und haben uns sehr herzlich empfangen. Das Haus ist gemütlich - die traumhafte Terrasse mit herrlichem Pool und Blick in die Berge lässt keine Wünsche offen. Wir durften Orangen und Zitronen ernten und genossen jeden Tag frischen Saft. Bis zum Ortszentrum sind es nur wenige Gehminuten und auch der Einstieg in viele Wanderwege ist leicht erreichbar. Man kann - wie wir, die vielen einsamen Pfade der Tramuntana entdecken oder die Berge von der Dachterrasse aus bestaunen. Sehr zu empfehlen! Wir freuen uns sehr, dass Sie Ihren Urlaub und das Haus genossen haben. Wir hoffen, Sie wiederzusehen. Eine sehr starke Umarmung. Wir haben uns in dem großen, wunderbaren Garten mit Orangen- ZItronenbäumen mit ausreichend großer und gepflegten Casita für 2 Personen sehr gut erholt. Es war alles da, was wir in der Küche und zum komfortablen Aufenthalt benötigten. Auch im Februar, wenn Sollérs Nächte noch sehr frisch sind, wird es mit HIlfe der Klimaanlage im Haus sehr schnell warm. Ich war trotzdem sehr froh, meine Lammfellhausschuhe dabei gehabt zu haben (Fliesen). Tagsüber haben wir die sonnigen Terrasse sehr ausgiebig genutzt oder waren in der Umgebung etwas wandern. EInkaufen oder essen gehen ist in wenigen Fußminuten erreichbar, ins Ortzentrum etwa 10 Minuten. Zum Frühstücken haben wir den besten Platz gehabt: Auf der sonnigen Terasse mit jeden Morgen frisch gepressten Orangensaft mit den Orangen aus dem Garten! Der Kontakt mit Juana und Andrés war sehr unkompliziert und herzlich, sie sind äußerst liebenswürdige Gastgeber und immer ansprechbar. Für einen kleinen Mietwagen befindet sich ein Parkplatz auf dem Grundstück. Vielen Dank Wir freuen uns, dass Sie das Haus und den Garten genossen haben. Wir hoffen, Sie wiederzusehen. Cas Carboner is a really pretty villa, set among lemon and orange trees and with great views of the countryside surrounding Soller. We were here at the end of the season and didn't have the best of weather unfortunately, but that is the risk when you stay in the mountains in October. I suspect that in better weather we would have given this villa 5 stars. Note that the location on the map is incorrect, it is about 600m SW of the pin on the map, on the other side of the main road (and note the one-way streets). Parking is at the sports centre nearby if you don't wish to go up the driveway, and Juana and Andres met us there. The large bowl of fruit and wine were much appreciated. We used the Eroski supermarket in town, which is a 5 minute drive each way. We did use our mosquito coils when sitting outside. Very nice and relaxing. We now have some gorgeous Majorcan marmalade made using the lemons from your garden! Thank you Juana! Thank you very much for choosing our house and giving us the opportunity to meet you. Juana and Andres met us and welcomed us to the villa on arrival and showed us around the grounds. 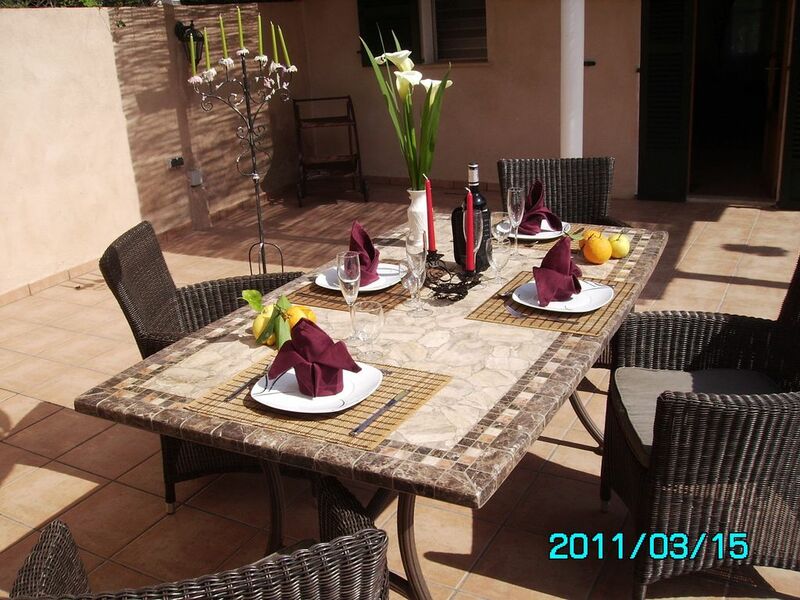 The villa was perfect for two people and was equipped with everything we needed. Everything was very clean and the shower was superb. Aircon worked very well and was very much needed in order to escape from the heat at times. However, the pool was always there to cool down in. There was no shock factor when taking a dip in the pool - it gets the sun all day so is a perfect temperature. The view is amazing and impossible to get bored of. Steady walk into town took 15-20 mins and the nearby restaurant Le Frontera takes 2-3 minutes - turn left at road from the rear entrance/exit of the villa. We spent a few leisurely lunches here, sampling typical mallorcan quisine at reasonable prices. However, don't get the sangria as it is surprisingly out of a bottle and is not particularly good. Taxi is 9 euros to Port de Soller and the tram is 7-8 euros each but try it at least once. We loved the ghekos around the villa that came out at night - they also ate the pesky mosquitos - make sure you keep the door shut all the time to keep them out of the villa (the mossies not the ghekos). This was definitely one of the nicest villas we have stayed in and would have loved to have spent another week there so do not hesitate to book your holiday here. Enjoy!!! Thank you very much for choosing our house. We are delighted to have met you. We hope to see you again. Cas Carboner was absolutely georgous and the owners extremely welcoming and helpful. The booking process was very straightforward and queries answered promptly via e-mail. The casita, inside and out, was exceptionally clean and had all you need for a fabulous stay. It definitely exceeded our expectations. The internal space was perfect for 2 adults or a small family and has a lovely traditional feel to it but is beautifully decorated and includes all mod cons. The outside space is something else, just amazing. Set in a large garden with many lemon and orange trees together with a few plum, peach and apple trees. The owners encourage you to pick and eat as much of the fruit as you like and there is certainly plenty of it. We had a constant supply of fresh orange juice, made by using the simple to use electric juicer in the kitchen, and more fruit than you could possibly get through. There is a wonderful covered terrace with a large table and 4 comfy dining chairs as well as 2 sunbeds and a large umbrella on the extensive terracing surrounding the fantastic pool. The views of the Tramuntana Mountains are amazing, even more so on the 1st floor roof terrace. The pool is kept spotlessly clean by Andres who comes around every couple of days to water the plants and check all is ok. He is very unobtrusive but it is nice to know someone is on hand should there be any problems. If you need to stay in touch with the 'real world' the Wi-Fi is excellent but don't waste too much time looking down at your screen, you don't know what you might miss!! We saw several Red Kite's overhead as well as a Booted Eagle and an Osprey and that was just whilst sitting on the patio! The location of the casita is perfect. A 15 minute pleasant, flat stroll takes you to the main square in Soller which has plenty of bars and restaurants to choose from and a lovely laid back atmosphere. We also walked down to the Port which took approx 45 minutes by road or a little longer if you chose the more scenic country path. If you enjoy walking there are many more walks in the area to chose from. We hired a car from the airport but the vehicular access to the casita is very narrow so you may want to park on the road outside. This was never a problem to us and the parking is free and unlimited. All in all this is a wonderful place to stay and we would go back in a heartbeat. Thank you Andres and Juana for such a warm welcome and an amazing stay in your beautiful little casita! Sóller est un quartier très agréable, a beaucoup de possibilités. Les randonneurs peuvent faire des randonnées dans la montagne. La maison est bien desservi par les bus arrêter 5 minutes et la gare 15 minutes avec le tram à côté de vous sur le port de Sóller avec un voyage extraordinaire. Le centre, qui est à environ 15 minutes à pied des boutiques, des bars, des restaurants et des banques. Dans soller nous pouvons trouver un tram et train d'un siècle, sa belle église et ses maisons en pierre typiques.